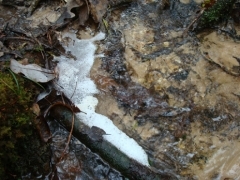 It is not uncommon to find foam gathering along Gulf beaches, edges of lakes, and in creeks and streams. Most people’s first thought is that foam on water is evidence of polluted water. Foam forms on water when two things happen: 1) something reduces surface tension on water such as introducing soap, detergents, oils, or natural organics and 2) air is mixed into the water as bubbles. Under natural conditions, water surface tension may be reduced when oils and other organic compounds are released by decomposing plant and algal matter and/or are leached from organic soils. Oils and organics rise to the surface, then bubbles may form by either waves sloshing the water around, such as on beaches, or water moving downstream and splashing against objects in the water like twigs and stumps, or in turbulence caused by eddies and currents. 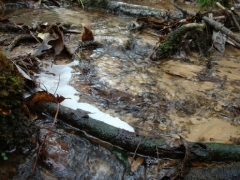 It is very common to find foam on the surface of streams that contain clear water that is darkly colored by the presence of tannins that are released into it by water flowing through wooded or boggy areas that contain an abundance of leaves and woody matter. 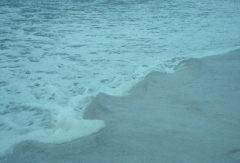 Most sources say that natural foam is most frequently found in the morning and disappears as the air warms. My experience is that it persists throughout the day along shaded streams. 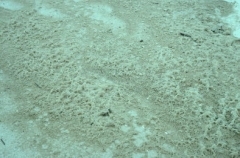 Natural foam is not harmful to life in water. In fact, fish love to gather beneath it as they do most floating things. * Give it the touch and smell test. Does the foam smell soapy or sweet? Is it heavy and thick, and feel slippery like suds in a sink? Natural foam does not. * Are there factors present that suggest natural foam: Lots of tannins in the water, as well as leaves, twigs, logs, and the like? * Are there conditions that could result in pollutants getting into the water? Are there businesses nearby that are draining into the water? Homes? Pipes with water emptying into the waterway? * In large bodies of water, enormous amounts of detergents are required to produce foam. If large quantities of foam are found and you suspect it is from a release, the culprit should be obvious. If not, and the foam passes the smell and touch test, it is probably natural foam. If you do find polluting foam, contact Louisiana Department of Environmental Quality. Water chemistry tests will give you a definitive answer. Beach in April 1991. in April 1991. Photo by Bob Thomas. Photo by Bob Thomas. Natural foam gathering against a fallen A closer view of the same natural foam. limb in a creek in Washington Parish, Photo by Bob Thomas.